A potential five-tool player who elected to enroll at Tech despite being selected in the 31st round of the 2006 Major League Draft by the Colorado Rockies....plans to transfer to Lewis & Clark College for his final two seasons of eligibility. 2008: Saw action in just 13 games at Tech. 2007: Rated No. 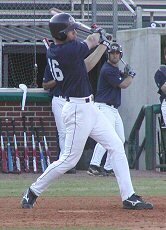 17 among "Top 50 Incoming Freshmen" by Baseball America....played in 36 games, including 13 starts in left field and nine in right field despite being hampered by pair of injuries which limited ability to see regular duty for much of season....drove in four runs, including a key three-run double for his first collegiate hit, and later scored winning run in 10th inning vs. Kennesaw State 2/13....belted first collegiate home run 3/10 vs. Virginia Tech as a part of a three-hit effort that raised season average to .345....went just 1-for-22 during the remainder of March....snapped 0-for-22 slump with pinch-hit double 4/24 at Turner Field vs. Georgia....played for Cotuit Kettleers of Cape Cod Baseball League during the summer. High School: Three-year letter-winner for coach Terry Agnew at Woodinville High School....Helped Woodinville to the 2004 and 2006 King County Championships....Hit .575 with nine home runs, 14 doubles, 39 RBI and a 1.080 slugging percentage as a senior, all establishing Woodinville single-season records....Named all-state Class 4A, all-area, and all-district in 2006....Member of the 2006 Seattle Times All-Star Team....Ranked the No. 93 high school player in the nation by Baseball America....Academic Athlete of the Year in 2006....Ranked 26th out of 463 students in his graduating class....Played for Bankers Baseball during summer of 2006.